It was, as usual, a balmy afternoon in Yangon, with chaotic traffic comprising old Japanese Rosa buses and sedans belching smoke – and people merrily jaywalking. I escaped the chaos through a side road, and rushed into the headquarters of the National League for Democracy (NLD). The NLD occupies an unimposing three-storey building, with some new additions constructed atop the original structure, which is several decades old. From afar, it looks like an old post office or a building that a communist party – from a forgotten era – would use. Outside, there’s a stand where T-shirts and other souvenirs of The Lady are being sold. There was a time when Aung Sung Suu Kyi was under house arrest, and the NLD office was mostly barricaded; uttering her name in public would spell definite trouble for her followers. She had been released from house arrest for over three years, by the time I visited the NLD office. The party was in the top gear, and there was a major membership drive, by the looks of which it was not needed, given the unparalleled popularity of both The Lady and NLD. There were women seated around desks, pasting photos on party membership cards. I walked in and strolled around, and no one seemed to care. There were several other foreign journalists inside, so one more didn’t make much difference. The party workers were obviously used to them. I had my first meeting with the icon of democracy, the day before. Several hundred people had awaited her arrival in an air-conditioned auditorium. Most were foreigners. Upon entering, she held the audience in the palm of her hand. There was a short Q&A, and she only answered the questions she felt deserved answers. She looked the audience in the eye, and said: “With greater freedom comes greater responsibility,” and there was a collective bowing of heads. This was her response to a statement from the audience, that minorities like the Muslim Rohingya, were being persecuted; and that she – the great beacon of democracy, not only in Myanmar, but also the rest of the world – had done precious little to stop it. Her answer was that for Myanmar to rectify the wrongs of the past, the rule of law had to be established. 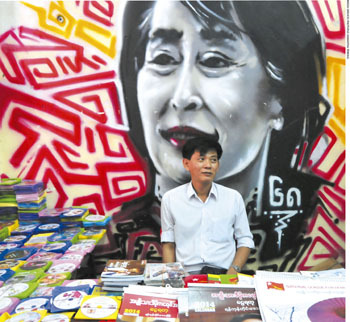 As Aung Sung Suu Kyi conducted her election campaign, it was obvious that she had transformed from being a fighter, into playing the role of a pragmatic political party leader. She had made the transition, but it was not to the liking of some of her fans – especially those living outside Myanmar. In a country where 87 percent of the population is Buddhist, she could not run the risk of alienating that vote block, especially when monks had been at the vanguard of the democracy uprising from 1988 until 2008. “Only those who don’t know the inner workings of Myanmar will press her to speak all out against the ultra-extremist Buddhists,” an Asian diplomat stationed in Yangon told me. Despite murmurs of discontent outside Myanmar, it was obvious that The Lady was almost divine to the populace. I have never seen such a charismatic woman. When she walked into a township meeting not far from Yangon, people who had waited for her for three hours hadn’t complained one bit, nor left. In fact, as she drove in, tears began rolling down many cheeks. Before my meeting, a trusted friend told me that – despite the international unease – she was still the reincarnation of the bodhisattva, to many of her countrymen. My friend (let’s call him Hyat) has seen it all. He came of age during the 1988 uprising, and was in the midst of it in 2008. The ride took me into the dark alleys of Yangon, under the overpasses, to dark street corners and ill-lit apartment blocks dating back some five decades. Everywhere we went, people acknowledged Hyat with a nod. “This is where we decided how to smuggle out the images of the 2008 demonstrations,” he said, pointing to a street corner. The dark street corner looked more like a location where you would find illicit cigarettes, or worse. We drove down University Avenue, where the house in which The Lady spent years under house arrest is located. Though closed for many years, the road is now open… but The Lady is rarely home. Hyat told me tales of how people would stand on the shore across the lake, and listen to her play the piano. Our journey ended at a shabby restaurant, where boisterous men were high-fiving – they offered me a welcome straight out of a movie. Hyat and several of his pals sat down with me, and it is here that I understood The Lady’s true value to them. “When there was no hope, she gave us hope – she was our only hope. There were neighbourhood vigilante committees monitoring every word we uttered, merely to catch even a whisper of her name; and that would be sufficient to put us in the infamous Insein Prison. We held on to hope even then; so who are we to question that hope now?” he asked. It has been almost a year since the elections, in which the NLD secured an overwhelming majority in Parliament. Since she is barred by the Constitution from holding office as president, The Lady has installed one of her trusted aides as Myanmar’s President. There is criticism that the NLD is as bad as the regime it replaced – since oppression continues, even though it is subtle. At the time of writing this column, a story made the news, saying that an NLD spokesperson had verbally abused a journalist. With the Rohingya, many outsiders had expected the new NLD Government to begin using the term ‘Rohingya,’ even though it is not officially recognised by state authorities in Myanmar. The Government has been criticised because it has been slow to take assertive action. “The newly installed NLD Government moved swiftly to release many of the political prisoners whose stories are related in this report. It should now take immediate steps to repeal or substantially amend the laws that have been used in recent years to restrict and penalise expression and peaceful assembly, in violation of international law. Doing so would be consistent with the NLD’s commitment,” Human Rights Watch noted, earlier this year. It is no great secret that The Lady is not too keen on delegation and has the patience to wear down opponents. Ula Min, who is 70-plus, is an activist with the NLD. He knows this characteristic well. His involvement with NLD dates back to its infancy, in August 1988, when The Lady emerged from the woodwork and helmed the fledgling pro-democracy movement. Min has vivid memories of listening to The Lady talk at the famed Shwedagon Pagoda, and then running from soldiers who were chasing down street protestors. He lost his government job and a full set of front teeth, because of his role in NLD politics. In July 1989, as The Lady was placed under house arrest, Min found himself in jail for the first time. For the next 25 years, their lives would be interwoven with the history of their country. As his leader found herself confined to her house in Yangon, Min was in and out of jail, where he was tortured like many other NLD activists. Who am I to question that?